The all-new Mazda MX-5 RF is almost with us, so to celebrate, Mazda UK sent some ‘lucky YouTubers’ to the ‘amazing roads’ of Barcelona for a test drive. The group was taken to ‘Mazda Space’, an exhibition of all Mazda models, past, present and future. The ‘Mazda Space’ serves as a hub for the company’s European events, and exhibits new cars in the heart of Barcelona with the purpose of allowing customers to ‘fully experience and follow the Mazda brand’. 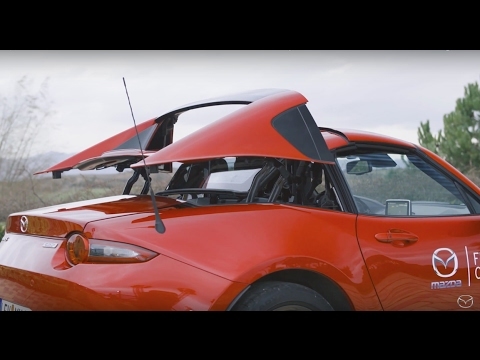 The YouTubers were given the opportunity to mix with executives and designers at the all-new Mazda MX-5 RF preview event, and later they were given a red all-new Mazda MX-5 RF to test drive. The new addition to the Mazda MX-5 family was particularly praised for its ‘amazing handling of corners’ and being the ‘best-looking Mazda MX-5 by far’. With this in mind, Mazda UK took a look back at some of the other ‘iconic heritage models’ at the ‘Mazda Space’ exhibition. The 1967 Cosmo, known for being the first Mazda to ever feature a rotary engine, was highlighted as a must-see at the event. Further, the Le Mans special edition Mazda MX-5, built to mark Mazda’s victory in the famous 24 Hours of Le Mans race, and the 10th and 25th anniversary Mazda MX-5 models were two more of the popular attractions.